The Summer of Jordi Perez is a lighthearted book about Abby, a queer girl who falls in love for the first time. Meanwhile, she navigates friend drama and finds the best burger in Los Angeles. If you love books about romance and accepting who you are, you'll enjoy this book. 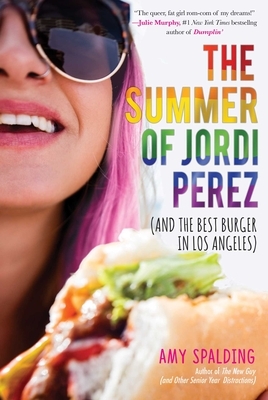 Today I finished The Summer of Jordi Perez (And the Best Burger in Los Angeles). First, I have to say, I LOVED this book. I absolutely adored Abby, who was such a complete character, with a perfect amount of insecurities and worries. Even though we don’t have a whole lot in common (I cannot put a cute outfit together to save my life), I could really identify with her as a queer girl. Because there are almost NO books about queer girls, reading this one felt so, so, so good. I loved all of the relationships in the book, and thought that there was a really good balance between romance and other things. I thought that Abby’s relationship with her mom was really well written and well developed. It also offered a touch of humor in the form of Jax and the search for LA’s best burger. I would definitely recommend this book to anyone who likes cute romance, books with LGBTQ characters, or just wants a fun happy read.